Movable type is the system of printing and typography that uses movable components to reproduce the elements of a document (usually individual letters or punctuation). The first known movable type system was invented in China by Bi Sheng out of ceramic between 1041 and 1048. Metal movable type was first invented in Korea during the Goryeo Dynasty (around 1230). This led to the printing of the Jikji in 1377—today the world's oldest extant movable metal print book. Neither movable type system was widely used, probably because of the enormous amount of labour involved in manipulating the thousands of ceramic tablets, or in the case of Korea , metal tablets, required by the use of Chinese characters.Around 1450, Johannes Gutenberg introduced what is generally regarded as an independent invention of movable type in Europe (see printing press), along with innovations in casting the type based on a matrix and hand mould. 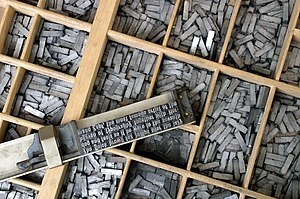 Gutenberg was the first to create his type pieces from an alloy of lead, tin and antimony—the same components still used today. Compared to woodblock printing, movable type pagesetting was quicker and more durable for alphabetic scripts. The metal type pieces were more durable and the lettering was more uniform, leading to typography and fonts. The high quality and relatively low price of the Gutenberg Bible (1455) established the superiority of movable type, and printing presses rapidly spread across Europe, leading up to the Renaissance, and later all around the world. Today, practically all movable type printing ultimately derives from Gutenberg's movable type printing, which is often regarded as the most important invention of the second millennium. The technique of imprinting multiple copies of symbols or glyphs with a master type punch made of hard metal first developed around 3000 BC in ancient Sumer. Bricks for buildings and bars or ingots of precious metal were imprinted with a distinctive stamped design; the act of stamping the ingots certified them as currency by the power of the authority symbolized by the type image. These metal punch types can be seen as precursors of the letter punches adapted in later millennia to printing with movable metal type. Cylinder seals were also used to "sign" documents and mark objects as the owner's property. By 650 BC the ancient Greeks were using larger diameter punches to imprint small page images onto coins and tokens. Cylinder seals were a related form of early typography capable of printing small page designs in relief (cameo) on wax or clay—a miniature forerunner of rotogravure printing used by wealthy individuals to seal and certify documents. The designs of the artists who made the first coin punches were stylized with a degree of skill that could not be mistaken for common handiwork—salient and very specific types designed to be reproduced ad infinitum. Unlike the first typefaces used to print books in the 13th century, coin types were neither combined or printed with ink on paper, but "published" in metal—a more durable medium—and survived in substantial numbers. As the portable face of ruling authority, coins were a compact form of standardized knowledge issued in large editions, an early mass medium that stabilized trade and civilization throughout the Mediterranean world of antiquity. The enigmatic Minoan Phaistos Disc of 1800–1600 BC has been considered by one scholar as an early example of a body of text being reproduced with reusable characters: it may have been produced by pressing pre-formed hieroglyphic "seals" into the soft clay. A few authors even view the disc as technically meeting all definitional criteria to represent an early, if not the earliest incidence of movable type printing. Recently it has been alleged by Dr. Jerome Eisenberg that the disk is a forgery. Following the invention of paper in the Han Dynasty, writing materials became more portable and economical than the bones, shells, bamboo slips, metal or stone tablets, silk, etc. previously used. Yet copying books by hand was still labour-consuming. Not until the Xiping Era (172-178 AD) towards the end of the Eastern Han Dynasty did sealing print and monotype appear. It was soon used for printing designs on fabrics, and later for printing texts. Woodblock printing worked as follows. First, the neat hand-copied script was stuck on a relatively thick and smooth board, with the front of the paper, which was so thin that it was nearly transparent, sticking to the board, and characters showing in opposite, so distinctly that every stroke could be easily recognized. Then, carvers cut the parts with no character off the board with knives, so that the characters were cut in relief, completely different from those cut in intaglio. When printing, the bulging characters would have some ink spread on them and be covered by paper. With workers’ hands moving on the back of paper gently, characters would be printed on the paper. By the Song Dynasty, woodblock printing came to its heyday. Although woodblock printing played an influential role in spreading culture, there were still some apparent drawbacks. Firstly, carving the printing plate cost too much time and too much labour and materials; secondly, it was not convenient to store these plates; and finally, it was difficult to correct mistakes. With woodblock printing, one printing plate could be used for tens of hundreds of books, playing a magnificent role in spreading culture. Yet carving the plate was time and labour consuming. Huge books cost years of effort. The plates needed a lot of storage space, and were often damaged by deformation, worms and corrosion. If books had a small print run, and were not reprinted, the printing plates would become nothing but waste; and worse, if a mistake was found, it was difficult to correct it without discarding the whole plate. Block printing, called tarsh in Arabic was developed in Arabic Egypt during the 9th-10th centuries, mostly for prayers and amulets. There were different types of print blocks, incluidng ones made from metal, wood and other materials. This technique, however, appears to have had very little influence outside of the Muslim world. Though Europe adopted woodblock printing from the Muslim world, initially for fabric, the technique of metal block printing was also unknown in Europe. Block printing later went out of use in Islamic Central Asia after movable type printing was introduced from China. Prior to the development of metal movable type, most printing was done using blocks carved from wood. Woodblock printing was used extensively in East Asia, and created the world's first print culture. Wooden movable type was first developed around 1040 AD by Bi Sheng(毕昇) (990–1051), as described by the Chinese scholar Shen Kuo (1031–1095), but was abandoned in favour of clay movable types due to uneveness of the movable wooden type after soaked in ink, also due to the presence of wood grains. In 1298, [[Wang Zhen (official)|Wang Zhen], a governmental official of Jingde, Anhui province, China, re-invented a method of making movable wooden types. He made more than 30,000 wooden movable types and printed 100 copies of Records of Jingde County (旌德县志), a book of more than 60,000 Chinese characters. Soon afterwards, he summarized his invention in his book A method of making moveable wooden types for printing books. Although the wooden type was more durable under the mechanical rigors of handling, repeated printing wore the character faces down, and the types could only be replaced by carving new pieces. This system was later enhanced by pressing wooden blocks into sand and casting metal types from the depression in copper, bronze, iron or tin. The set of wafer-like metal stamp types could be assembled to form pages, inked, and page impressions taken from rubbings on cloth or paper. A particular difficulty posed the logistical problems of handling the several thousand characters whose command is required for full literacy in Chinese language. In spite of these shortcomings, wooden movable types were used continually in China. Even as late as 1733, a 2300 page volume, 《武英殿聚珍版丛书》, was printed with the system on order of the Yongzheng Emperor. When he wished to print, he took an iron frame and set it on the iron plate. In this he placed the types, set close together. When the frame was full, the whole made one solid block of type. He then placed it near the fire to warm it. When the paste [at the back] was slightly melted, he took a smooth board and pressed it over the surface, so that the block of type became as even as a whetstone. For each character there were several types, and for certain common characters there were twenty or more types each, in order to be prepared for the repetition of characters on the same page. When the characters were not in use he had them arranged with paper labels, one label for each rhyme-group, and kept them in wooden cases. If one were to print only two or three copies, this method would be neither simple nor easy. But for printing hundreds or thousands of copies, it was marvelously quick. As a rule he kept two forms going. While the impression was being made from the one form, the type was being put in place on the other. When the printing of the one form was finished, the other was then ready. In this way the two forms alternated and the printing was done with great rapidity. In 1193, Zhou Bida, an officer of Southern Song Dynasty, made a set of clay movable type method according to the method described by Shen Kuo in his Dream Pool Essays, and printed his book Notes of The Jade Hall 《玉堂杂记》. As late as 1844 there were still books printed in China with clay movable types. However, Bi Sheng's fragile clay types were not practical for large-scale printing. Transition from wood type to metal type occurred in 1234 during the Goryeo Dynasty of Korea and is credited to Choe Yun-ui. A set of ritual books, Sangjeong Gogeum Yemun were printed with the movable metal type in 1234.Examples of this metal type are on display in the Asian Reading Room of the Library of Congress in Washington, D.C. The oldest extant movable metal print book is the Jikji, printed in Korea in 1377. At first, one cuts letters in beech wood. One fills a trough level with fine sandy [clay] of the reed-growing seashore. Wood-cut letters are pressed into the sand, then the impressions become negative and form letters [molds]. At this step, placing one trough together with another, one pours the molten bronze down into an opening. The fluid flows in, filling these negative molds, one by one becoming type. Lastly, one scrapes and files off the irregularities, and piles them up to be arranged. A potential solution to the linguistic and cultural bottleneck that held back movable type in Korea for two hundred years appeared in the early 15th century—a generation before Gutenberg would begin working on his own movable type invention in Europe—when King Sejong the Great devised a simplified alphabet of 24 characters (hangul) for use by the common people, which could have made the typecasting and compositing process more feasible. But Sejong's brilliant creation did not receive the attention it deserved. Adoption of the new alphabet was stifled by the inertia of Korea's cultural elite, who were "...appalled at the idea of losing Chinese, the badge of their elitism." Proliferation of movable type was also obstructed by a "Confucian prohibition on the commercialization of printing" restricted the distribution of books produced using the new method to the government. The technique was restricted to use by the royal foundry for official state publications only, where the focus was on reprinting Chinese classics lost in 1126 when Korea's libraries and palaces had perished in a conflict between dynasties. In the early fifteenth century, however, the Koreans invented a form of movable type that has been described by the French scholar Henri-Jean Martin as '[extremely similar] to Gutenberg's'; the Western invention may have been stimulated by what had happened in the East. During the Mongol Empire (1206–1405), printing using movable type spread from China to Central Asia. The Uyghur of Central Asia used movable type, their script type adopted from the Mongol language, some with Chinese words printed between the pages, a strong evidence that the books were printed in China. In the 1298 book Zao Huozi Yinshufa (造活字印书法/造活字印書法) of the Chinese official Wang Zhen, there is mention of tin movable type, but this was largely experimental. It was not until the In Ming Dynasty (1368–1644 AD) that metal movable type was successfully employed, and invented separately from Korea. Successful use of metal movable type in China was first employed by Hua Sui in 1490 AD with his bronze type. In 1574 the massive 1000 volume encyclopedia Imperial Readings of the Taiping Era 《太平御览》/《太平御覧》 were printed with bronze movable type. In1725，the Qing Dynasty government made 250,000 bronze movable type characters and printed 64 sets of the encyclopedic Gujin Tushu Jicheng Complete Collection of Illustrations and Writings from the Earliest to Current Times 《古今图书集成》/《古今圖書集成》. Each set consisted of 5040 volumes, making a total of 322,560 volumes printed using movable type. Johannes Gutenberg of Mainz is acknowledged as the first to invent a metal movable type printing system in Europe. Gutenberg was a goldsmith familiar with techniques of cutting punches for making coins from moulds. Between 1436 and 1450 he developed hardware and techniques for casting letters from matrices using a device called the hand mould. Gutenberg's key invention and contribution to movable type printing in Europe, the hand mould was the first practical means of making cheap copies of letterpunches in the vast quantities needed to print complete books, making the movable type printing process a viable enterprise. Before Gutenberg, books were copied out by hand on scrolls and paper, or printed from hand-carved wooden blocks. It was extremely time-consuming, even a small book could take months to complete, and the carved letters or blocks were very flimsy and the susceptibility of wood to ink gave such blocks a limited lifespan. Gutenberg and his associates developed oil-based inks ideally suited to printing with a press on paper, and the first Latin typefaces. His method of casting type may have been different from the hand mould used in subsequent decades. Detailed analysis of the type used in his 42-line Bible has revealed irregularities in some of the characters that cannot be attributed to ink spread or type wear under the pressure of the press. Scholars conjecture that the type pieces may have been cast from a series of matrices made with a series of individual stroke punches, producing many different versions of the same glyph. It has also been suggested that the method used by Gutenberg involved using a single punch to make a mould, but the mould was such that the process of taking the type out disturbed the casting, creating variants and anomalies, and that the punch-matrix system came into use possibly around the 1470s.This raises the possibility that the development of movable type in the West may have been progressive rather than a single innovation. Gutenberg's movable type printing system spread rapidly across Europe, from the single Mainz press in 1457 to 110 presses by 1480, of which 50 were in Italy . Venice quickly became the center of typographic and printing activity. Significant were the contributions of Nicolas Jenson, Francesco Griffo, Aldus Manutius, and other printers of late 15th-century Europe. Despite some conjectures (see), there is no evidence that movable type from the East ever reached Europe. In ancient China, printing had been practiced for a long time, but the method generally used was what is known as "block printing", the carved woodblock being used to print a single page of a specific text. This method was appropriate for cultures which used thousands of ideograms rather than an alphabet of 20 to 30 letters. Movable type, invented by Bi Sheng, a common-person inventor in Beisong Dynasty, overcame the shortcomings of woodblock printing. As long as sufficient type fonts were prepared, the printing plate could be pieced together at any time, saving a great deal of time. After printing, the printing plate could be torn apart. The type fonts could be used repeatedly, and they took little room so it was easy to store them. Thus movable type stood out with its advantages. Bi Sheng, a common intellectual, summarized the abundant experience of woodblock printing and conducted countless experiments before completing cement type font and set typing in Qingli Years, ruled by Songrenzong (1041–1048AD). His achievement completed one significant revolution in printing history. According to some archaeologists, this was the beginning of typography in China, but it failed to become widely used in China. Even though Bi Sheng improved the efficiency of printing with movable type, his achievement did not catch the attention of the ruler nor the society of the time. Even after his death, movable type was not widespread and the cement type fonts were lost, although his printing technology was passed on. For this reason, the Chinese invention of movable type in the eleventh century had little impact and movable type did not spread through the world until Gutenberg’s invention. The French essayist Michel de Montaigne (1533–92) told his readers that the Chinese had already enjoyed the benefits of printing for 'a thousand years'. Type-founding as practiced in Europe and the west consists of three stages. Punchcutting: If the glyph design includes enclosed spaces (counters), a counterpunch is made. The counter shapes are transferred in relief (cameo) onto the end of a rectangular bar of mild steel using a specialized engraving tool called a graver. The finished counterpunch is hardened by heating and quenching (tempering), or exposure to a cyanide solution (case hardening). The counterpunch is then struck against the end of a similar rectangular steel bar—the letterpunch—to impress the counter shapes as recessed spaces (intaglio). The outer profile of the glyph is completed by scraping away with a graver the material outside the counter spaces, leaving only the stroke or lines of the glyph. Progress toward the finished design is checked by successive smoke proofs; temporal prints made from a thin coating of carbon deposited on the punch surface by a candle flame. The finished letterpunch is finally hardened to withstand the rigors of reproduction by striking. One counterpunch and one letterpunch are produced for every letter or glyph making up a complete font. Matrix: The letterpunch is used to strike a blank die of soft metal to make a negative letter mould, called a matrix. Casting: The matrix is inserted into the bottom of a device called a hand mould. The mould is clamped shut and molten type metal alloy consisting mostly of lead and tin, with a small amount of antimony for hardening, is poured into a cavity from the top. Antimony has the rare property of expanding as it cools, giving the casting sharp edges. When the type metal has sufficiently cooled, the mould is unlocked and a rectangular block approximately 4 centimeters long, called a sort, is extracted. Excess casting on the end of the sort, called the tang, is later removed to make the sort the precise height required for printing, known as "type height", approximately 0.918 inches. Modern, factory-produced movable type was available in the late 19th century. It was held in the printing shop in a job case, a drawer about 2 inches high, a yard wide, and about two feet deep, with many small compartments for the various letters and ligatures. The most popular and accepted of the job case designs in America was the California Job Case, which took its name from the Pacific coast location of the foundries that made the case popular. Regardless of who actually invented the case, in order to make his typesetting more efficient, the inventor arranged the compartments according to the letters' frequency of use. The more frequent letters (t, n, e, i, o, r) are arranged in a rough circle directly in front of the typesetter, while the less-frequently used letters and characters are further away. The arrangement of the letters in the California Job Case became so popular and commonly adopted that a skilled typesetter could "read" the text set by another typesetter, just by watching the positions of the compartments where the typesetter reached for his letters. The California Job Case has three sections, with the rightmost sections containing capital letters in alphabetic order except for the "J" and "U", moved to the lowest line to help avoid confusing them with "I" and "V" respectively. The lower case letters and punctuation marks are in the left and center sections, with the numbers 1 to 8 at the top of the center section, while the ligatures (combined letters, such as "ff", "fi", "æ" etc.) are in various locations about the exterior. In addition to placing the most commonly used letters in setting text in a given language in the easiest positions for the typesetter to get to, the characters' boxes varied in size depending upon the frequency of usage of the character. Thus for English the "e" box is the largest while the "j", "k", "q", "x", and "z" boxes are the smallest. Prior to the adoption of the California Job Case, the capital letters were stored in a separate drawer or case that was located above the case that held the other letters; this is why capital letters are called "upper case" characters while the non-capitals are "lower case". Other large compartments in the California Job Case held spacers, which are blocks of blank type used to separate words and fill out a line of type, such as em and en quads (quadrats, or spaces. A quadrat is a block of type whose face is lower than the printing letters so that it does not itself print.). An em space was the width of a capital letter "M" – as wide as it was high – while an en space referred to a space half the width of its height (usually the dimensions for a capital "N"). Individual letters are assembled into words and lines of text with the aid of a composing stick, and the whole assembly is tightly bound together to make up a page image called a forme, where all letter faces are exactly the same height to form a flat surface of type. The forme is mounted on a printing press, a thin coating of viscous ink is applied and impressions made on paper under great pressure in the press. "Sorts" is the term given to special characters not freely available in the typical type case, such as the "@" mark, etc. In 1997, Time Life magazine picked Gutenberg's invention to be the most important of the second millennium. In 1999, the A&E Network voted Johannes Gutenberg "Man of the Millennium". See also 1,000 Years, 1,000 People: Ranking The Men and Women Who Shaped The Millennium which was composed by four prominent US journalists in 1998. Richard W. Bulliet (1987), " Medieval Arabic Tarsh: A Forgotten Chapter in the History of Printing", Journal of the American Oriental Society 107 (3), p. 427-438. Man, John The Gutenberg Revolution:The story of a genius that changed the world (c) 2002 Headline Book Publishing, a division of Hodder Headline, London. ISBN 0-7472-4504-5. A detailed examination of Gutenberg's life and invention, interwoven with the underlying social and religious upheaval of Medieval Europe on the eve of the Renaissance. World Treasures of the Library of Congress. Retrieved 26 December 2006. Briggs, Asa and Burke, Peter (2002) A Social History of the Media: from Gutenberg to the Internet, Polity, Cambridge, pp.15-23, 61-73. Needham, Volume 5, Part 1, 212. Nesbitt, Alexander The History and Technique of Lettering (c) 1957, Dover Publications, Inc. ISBN 0486402819 , Library of Congress Catalogue Card Number: 57-13116. The Dover edition is an abridged and corrected republication of the work originally published in 1950 by Prentice-Hall, Inc. under the title Lettering: The History and Technique of Lettering as Design.